PHUKET: Chalong Police have today confirmed that a case related to an assault on a German tourist last month is being investigated and arrest warrants should be issued this week. Speaking to The Phuket News today (Oct 8), Col Pakkayot Tanongsak of the Chalong Police confirmed that officers are investigating an assault on German tourist Patrick Starke by four suspects with weapons at 10:30pm on Sept 27. 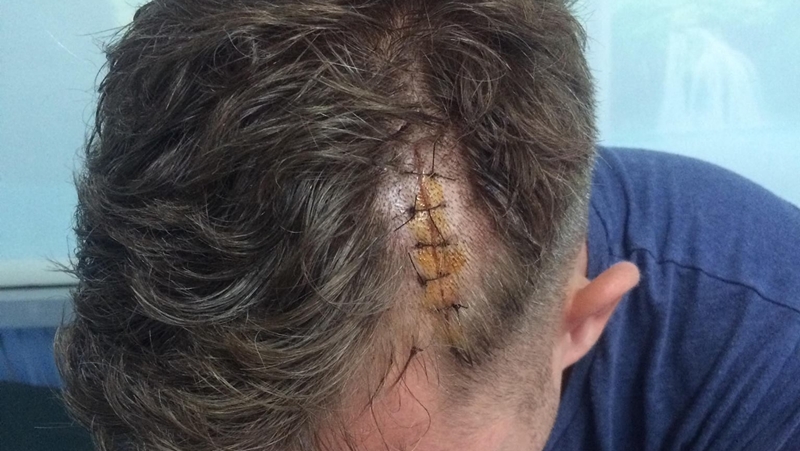 The attack, which left Mr Starke with wounds to head and arms, was caught on CCTV from in front of a 7-Eleven near Soi 11 Sai Yuan Rd in Rawai. Col Pakkayot said, “Police will seek arrest warrants from images caught on CCTV. Now we are waiting for the names of the four suspects who attacked the tourist. I expect the arrest warrants to be ready in this week. He added, “We have learned that prior to the attack, the tourist was acting crazy because he was drunk. He then came across the four suspects who decided to attack him. This is not about 'helping a attacked tourist'. This is about safety in public, which, again, you not have with just checking CCTV after primitive behavior. Need more police on the road to prevent further damaging the image of Phuket, or what is left of it. Investigation consisting of “lift, sweep and replace carpet”? Seriously though - nice of the police to give the four suspects warning that warrants are to be issued to allow them some time to slip away. Brilliant ! naughty tourist- how dare he get drunk and provoke this attacke. One can't make this stuff up! Hmmm...only 4 Thais?? ?...they must be the extra brave ones...or else the German bloke was pretty bombed on alcohol and the Thais knew there was no chance of getting hit back. Two reminders from this event...don't get drunk and act like an a-hole...and Thai males can be grand cowards.